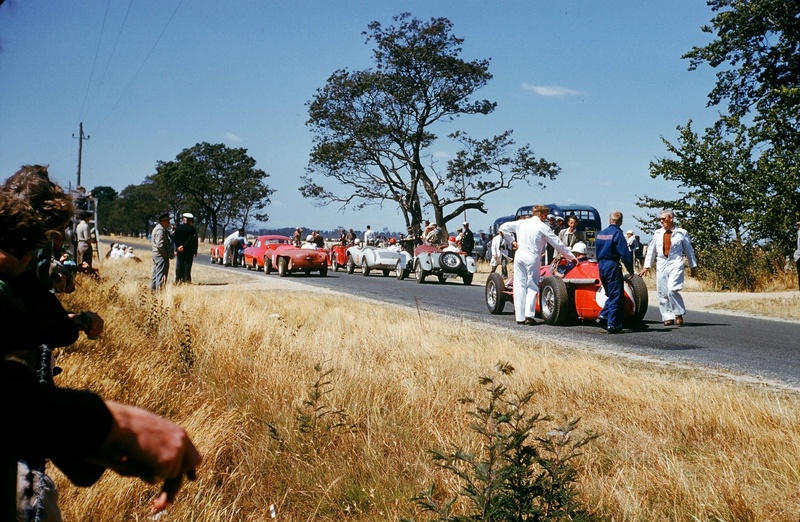 It was the first time the great Tasmanian circuit hosted a round of the national drivers championship, the locals turned out in droves, including enthusiast/photographer Bob Young who took these remarkable, crisp oh-so-clear, evocative photographs. Colour photos of this quality are so rare of Australian racing then. Each one in some ways deserves to be posted on its own but in the end I decided it was better to do a short article around them as a group. They are not the only shots he took on the day mind you- others have already been posted on the Historic Racing Car Club of Tassie Facebook page and filched by me! See the links at the articles end to view some of them. I wonder whether Stan is having a shot down the outside of Bib or is Bib plunging down the tiny- but just big enough gap Jones left for his fellow Melbourne motor dealer buddy/competitor. 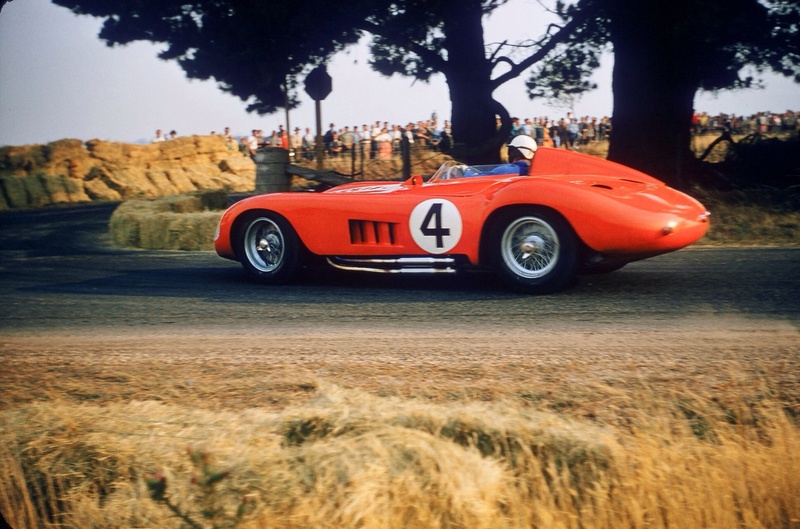 Whatever the case, i suspect Stan The Man- and he was very much one of them at the time, gathered Bib up on the long run out of the tight right-hander, gently rising and then steeper towards the Water Tower- 2.5 litres of Maser six having a bit more grunt than a 1.7 litre Climax FWA four. 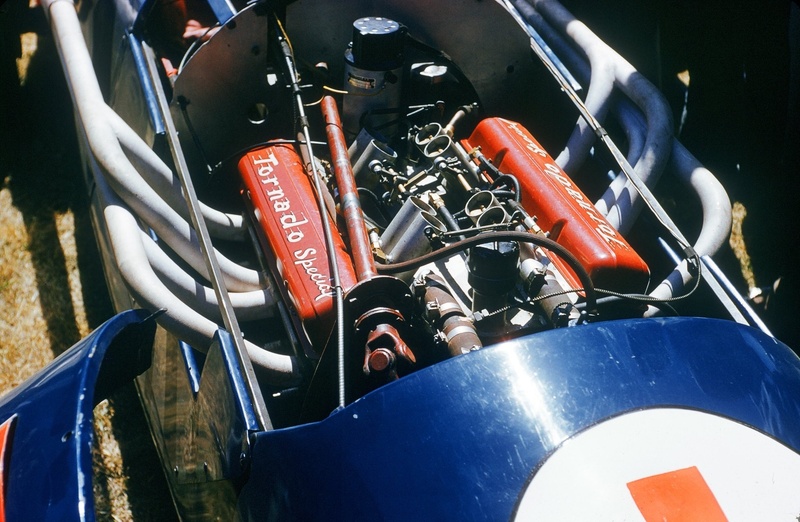 Bib sold his ex-Hunt 250F to Arnold Glass and jumped into the first of many water-cooled Coopers with the T43 (F2/9/57 according to John Blanden) whereas Stan, who changed racing cars more often than he did his Jocks- and had a long history of Cooper air-cooled and T23 experience, hung onto the 250F (chassis ‘2520’) and profited from the decision rather than jump into a Cooper just then. He did of course buy T51’s in time, with which he was very fast. Stan won the 1958 Gold Star with two victories at Fishermans Bend and Phillip Island- book-ending his season with wins and returned to Longford twelve months hence and finally won the AGP he so richly deserved aboard the 250F from Len Lukey. 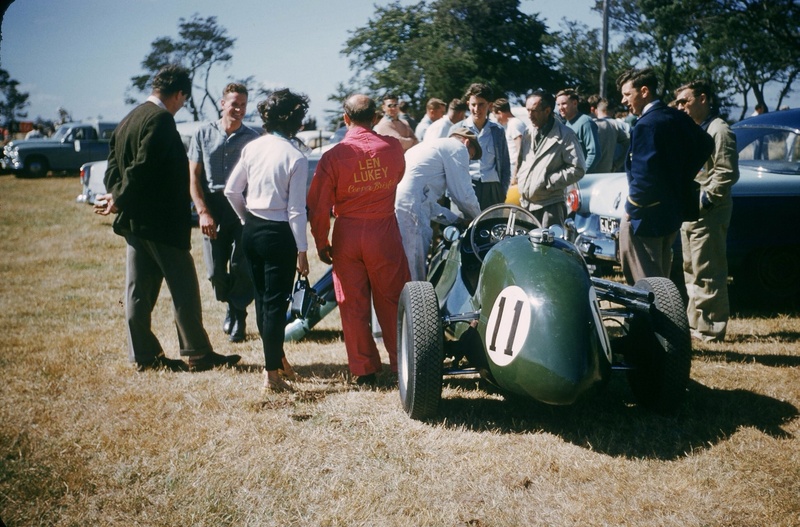 By that stage Lukey had switched from the Cooper T23 Bristol shown below to an ex-Brabham Cooper T45 Climax Jack raced in Australasia in late 1958 and over the summer races of 1959 before heading back to the UK and a World Championship aboard factory Cooper T51’s. Lukey’s Cooper Bristol was the ex-Tom Cole-Reg Hunt-Kevin Neal machine, chassis ‘CBR/2/9/53’ with which he did so well in 1957-8, but the reality was the car wasn’t an outright winner, hence the upgrade to the then, very much latest available, Cooper T45. With this he pursued Gold Star 1959 success in a year of speed, consistency, good preparation and perseverance- at twelve rounds it was the longest ever Gold Star championship. Late in its ‘in period’ Australian life the front engined T23 was fitted, as all of the Australian Cooper Bristols were, with a Holden ‘grey’-six or Chev small-block V8, in the case of this car a Holden engine. The racer eventually passed to the Donington Collection in the early seventies and later still back into private hands. There is little doubt a 2.5 litre Coventry Climax FPF powered Cooper would have very comfortably won the 1959 AGP and Gold Star but them things were like hens teeth- 2.5 FPF’s were issued only to works and favoured teams in Grand Prix racing until the Climax lads could keep pace with global demand which in practical terms meant during 1960. 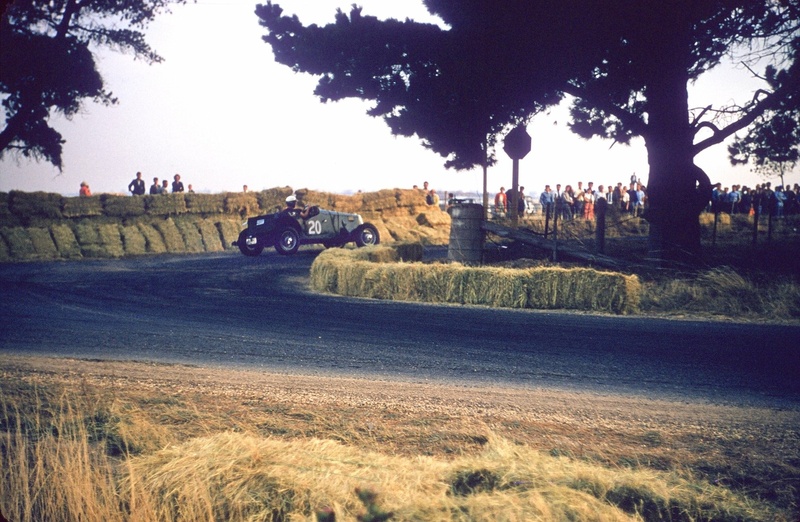 Ted Gray won the Longford Trophy on this clear but chilly Tasmanian weekend, to have heard the big, booming fuel-injected Chev V8 engined Tornado blasting its way around Longford would have been really something! This car does sound just like an F5000, imagine that in 1958! It’s showtime. Raceday. Just love this shot, atmosphere plus. Len Lukey’s and Lou Abrahams’ boys push their steeds to the form-up area. That beautiful, clever beastie to the left is Tornado 2 Chev 283, the yellow Cooper in the background is Aussie Millers T41. Note the Repco service van- its chilly too, 3 March is still summer’ish but most of the chaps are well rugged up against Tasmanian cool. 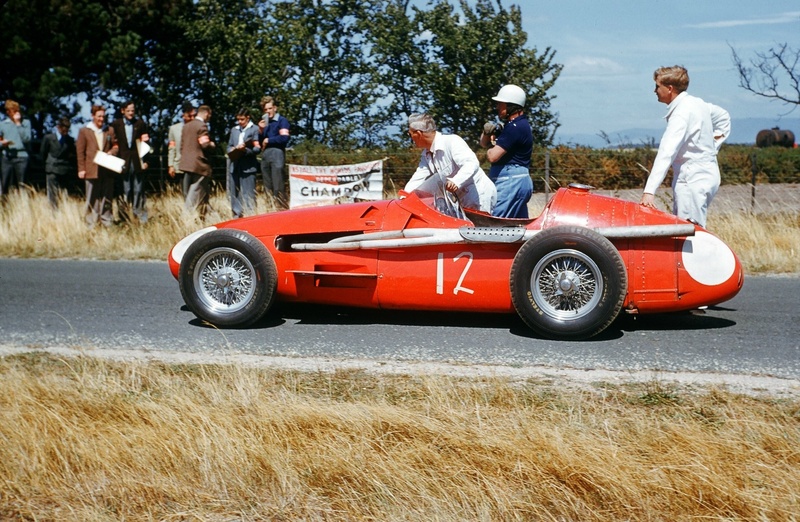 As you would have surmised from the foregoing descriptions of the cars, Australian National F1 at the time (until the end of 1963) was run to Formula Libre, hence the presence of Doug Whiteford’s ex-works Maserati 300S below. 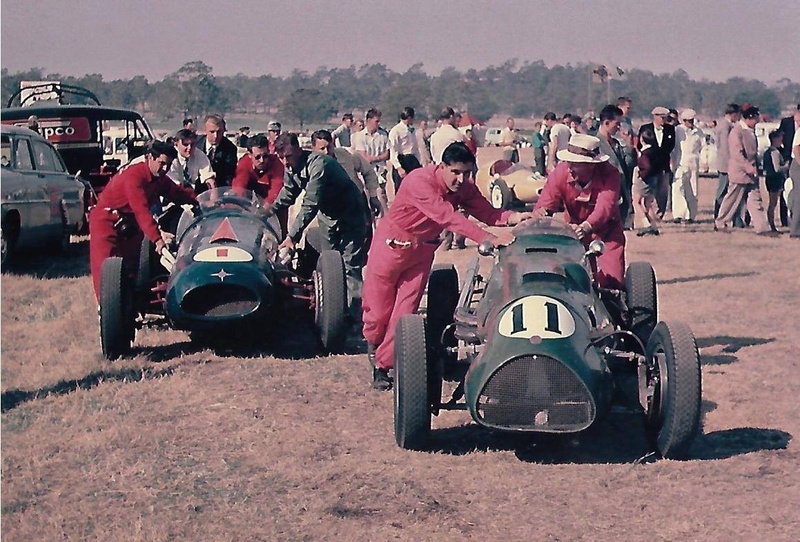 I have bemoaned the fact that Doug bought a sportscar from the Officine Maserati team at the end of the 1956 AGP weekend at Albert Park, rather than one of the three 250F’s they had with them. 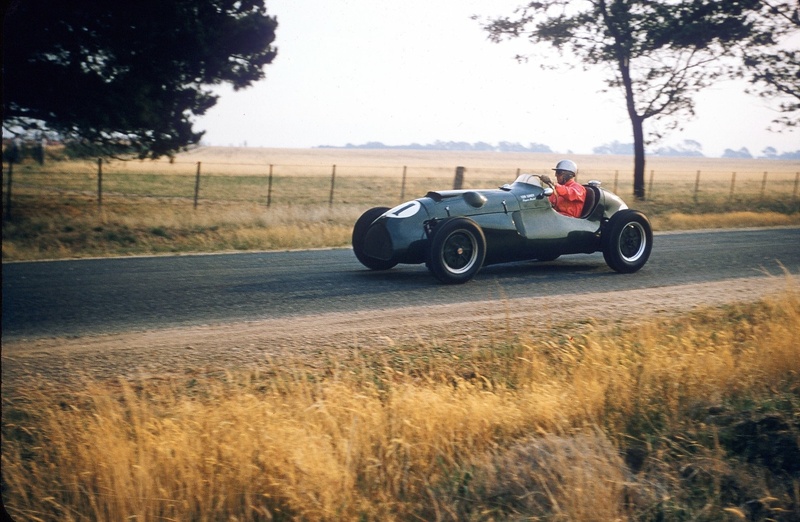 Whilst Douggie was no spring-chookin’ by then- he started racing pre-War and won his first AGP aboard his Ford V8 Spl ‘Black Bess’ back in 1950, he still would have given his contemporaries a serious run for their money in his always beautifully prepared and driven cars. Doug sold this car in the early-sixties to Bill Leech, the racer and pillar of the Victorian Light Car Club who used the car both on the road- it was a familiar sight on Beach Road jaunts from Brighton, and at historic meetings in the early years of such racing in Australia. It was a sad day when this ‘mobile Monet’ left our shores. 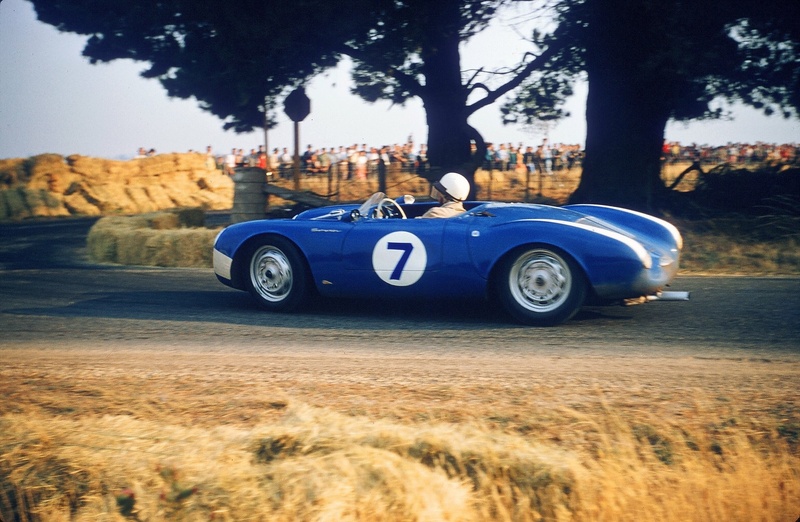 It was another batch of Bob Young’s photos which inspired an article I wrote a little while back on Norman Hamilton’s Porsche 550 Spyder, which on this weekend was driven by Melbourne Hillclimb ace Bruce Walton in the sportscar events. The photo below is of the A Edison entered 1250cc MG TF Spl- I know nothing about the car or driver, who can fill us in? It’s a bit of a puzzling photo really- the handicap grid sort of makes sense but Doug Whiteford belongs up the back with Stan as ‘scratch- men’ rather than at front left. John Youl’s red Porsche 356 stands out, other drivers and cars folks? 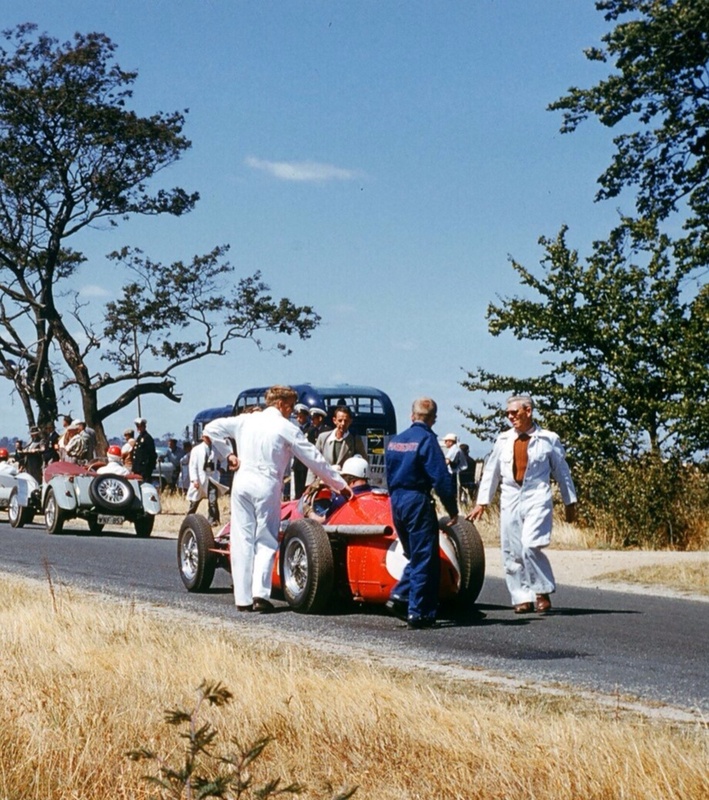 By the way, they are in the original starting line area, on The Flying Mile, just a way back from Mountford Corner, clearly Bob Young stuck to this part of the track and the paddock- to the right of the racing cars. John Sawyer is leaning on the tail, Otto Stone is on the right approaching, Stan readies himself in the cockpit, I wonder who the fella in the neato Maserati overalls is, and in the MG TF up the road to the right is Charles Button, still active in the Historic Racing Car Club of Tasmania today Grant Twining tells me. Wonderfully crisp & clear pics! Nice to read the Pirelli Stelvio sidewalls on the 250F. I’ve not learned the tread patterns of this period, so can’t tell what tires are on the Cooper T23 and Tornado. Would they also be Pirellis? I really don’t know, it’s not something I know anything about, I’ll have a flick thru Doug Nye’s History of GP Racing first book later in the week to see if I can glean anything. I wonder who the race tyre importers were in Oz back then too, or maybe it was DIY? Great pics and article Mark as usual thanks! Good to hear from you, may even get over during the Xmas Holidays with a bit of luck! Very enjoyable read Mark,my father always said Doug W was the best of the period and in a 250F would have been a winner. 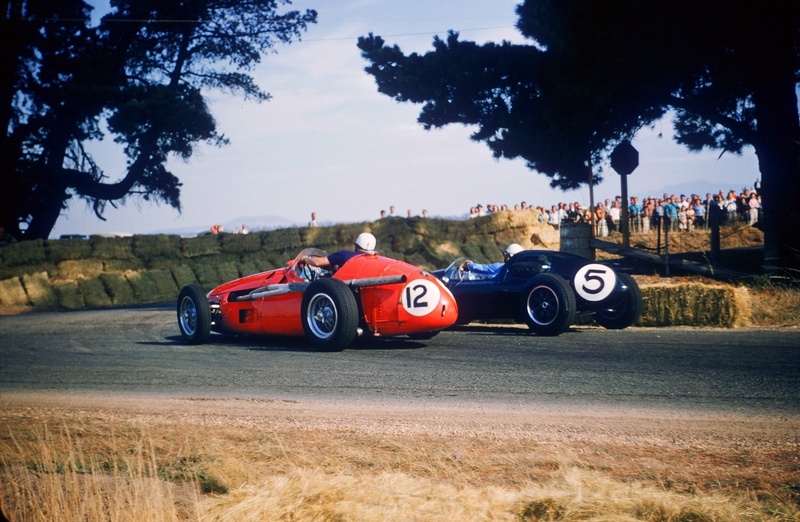 Am a fan too- he was a pro to a large extent so I guess he figured the start and prize-money would be better with the 300S, suited to a greater variety of events than a single-seater would have been. It also assumes Masers wanted to sell a car!- but I figure they would have been happy to part with the older of the three chassis if not the latest ’56 spec cars?